Ebro specialist, Eduardo Zancada, on everything you need to know about fishing on Europe’s most popular waterway including the permits, tackle and bait as well as tips for targeting the carp and cats! Eduardo Zancada with a rare Ebro mirror. Q: How long have you been fishing the Ebro? I have been fishing the Ebro River for seventeen years. 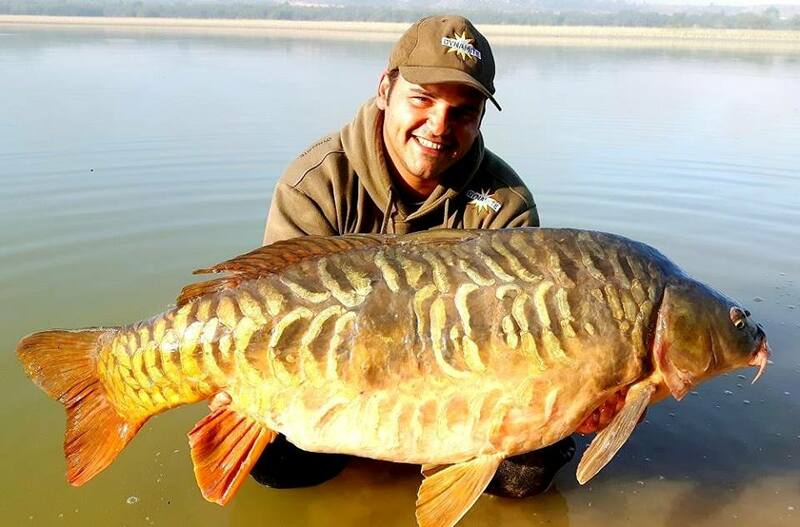 The river has such an incentive that one could not go anywhere else and fishing exclusively there and not get bored of the big carp and catfish. Q: What’s your best ever session on the Ebro? A session of three days, countless catches of carp with an average weight of between 15 and 20kg achieving some catch of up to 24kg, as well as many catfish up to 80kg. It was real madness! 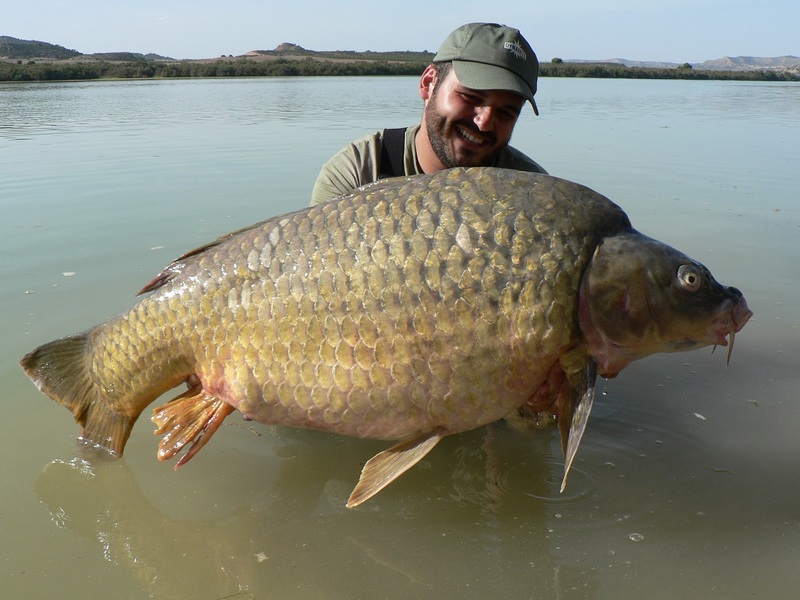 Q: What your biggest carp from the Ebro? 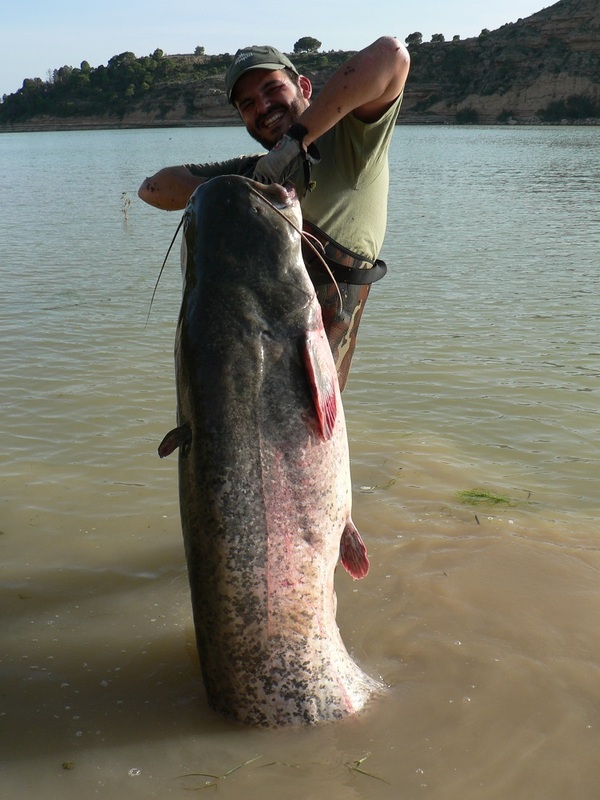 One of the Ebro’s big girls..
Q: What your biggest catfish from the Ebro? Q: How do you go about researching where to fish on the Ebro? I use a lot of google maps, I observe the geography of the river, its routes and locate the areas through which the main channel passes (deeper), with that, a bit of luck and my instinct of angler, sometimes I get to place myself in key positions. Q: Are there any areas of the river Ebro you recommend for fishing? In the small village of Mequinenza, there are slightly less fish but very big, the biggest catfish are here. The area near the Caspe village is also good. Q: Do you stick to one area or move around? My carp sessions are at least three days, I never move, it’s a wild river, very big, the fish usually move and move themselves in large groups, you just have to be in the right place waiting for them to pass. In addition, I try to locate narrow river areas (with a width of 350 meters) in this way I assure myself that I can cut the passage to the fish when they arrive, retain them with my baits and catch them. 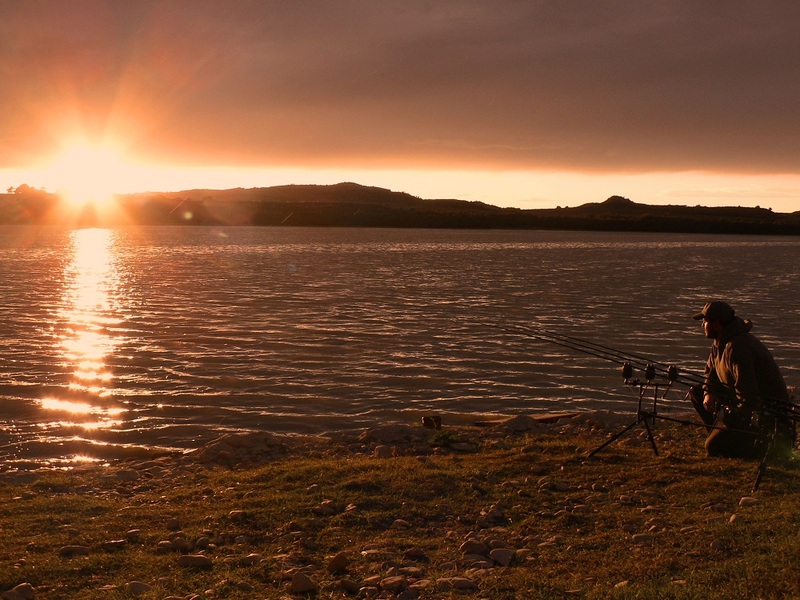 Q: What’s the best times of the year to fish the Ebro and why? As in many places, the autumn, the fish eat very well because they know that the cold will arrive soon, it is a time when the level of the river is stable. In spring in April and May is also good season, you will get many more catches but the fish would have dropped in weight a bit. For the catfish the summer is best. Q: How much bait do I need for a long weekend carping on the Ebro? 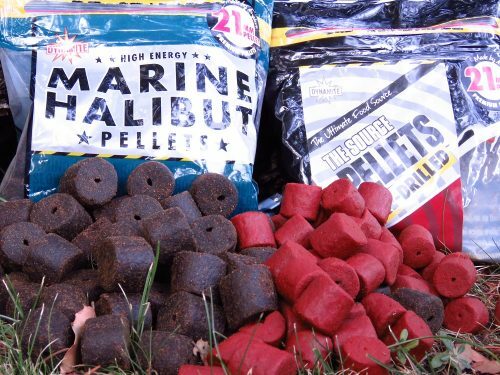 For three day sessions I would take about 20kg of boilies such as Robin Red or CompleX-T, 40kg of particles (Frenzied Tiger Nuts and Corn) and 50kg of big 21mm pellets. It is a very big, wild river, and its fish are too. You have to carry a lot of bait because if the fish go on the feed, in a few hours your bait will be all gone. you have to keep in mind that if a pair of catfish enter your zone, they can sweep all the bait in a couple of hours, and if you have catch a lot you have to be prepared to continue throwing bait into the water. Under normal conditions I throw a couple of kilos of bait into the water per rod. Q: Do I need any special permits to fish on the Ebro? Yes, you need two licenses. The first is the general license for fishing in Spain. The second are daily permits for the fishing zone. for around £50 you can be fishing legally for six days. Q: Do you need a guide for fishing the Ebro? A quick search on Google will reveal a whole host of companies offering full tour packages and guiding but you can just do it yourself if you wish. Just don’t forget the permits above. 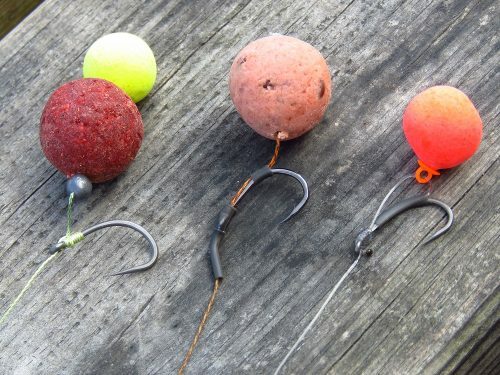 Q: What baits work best on the river for carp? It can not be denied that fish are used to halibut pellets on the Ebro. Anglers throw huge amounts of pellets into the water for the catfish. In my particular case I have tried many boilies and the carp are very selective, usually very few boilies work well. 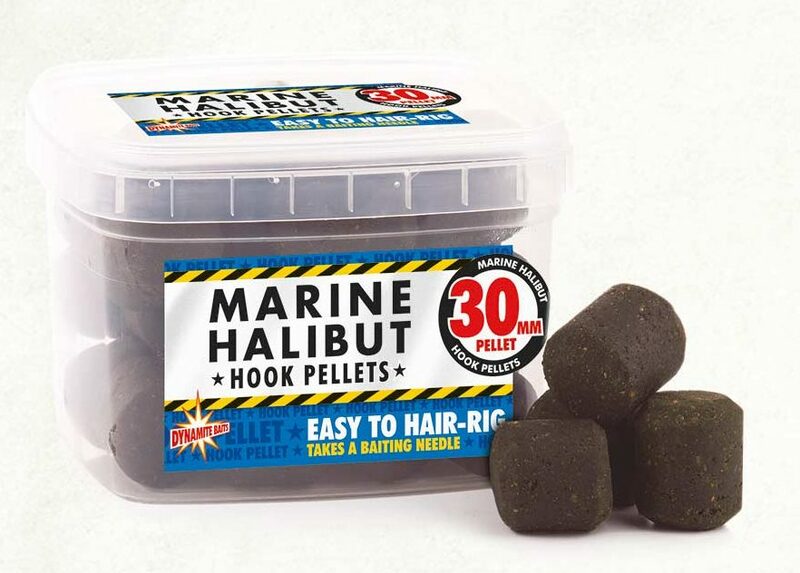 If you are looking for big carp using boilies you will be able to capture them, but the baits that I use the most are the 22mm Marine Halibut Pellets and Marine Halibut boilies as these go well with the pellets. I use these in 20 and 25mm sizes, along with Robin Red boilies in 20 and 25mm. Squid and Octopus boilies are another bait which works well, in addition, Pineapple Banana pop-ups are very famous on the Ebro when used in a snowman style with a boilie like those above. They are Fluro and hi in flavour. Q: What’s your tactical approach to feeding on the river? I usually try to cut off the path of the fish and target narrow areas of the river. I place rods on both sides of the river, fishing on the inside and outside the main channel as well. After I catch a few, I analyse where the catches are more concentrated and I then add more lines to this area. Q: What hook baits work best on the river Ebro for catfish? Three Marine Halibut pellets on the hair for the cat fish, fished with three kilos of pellets around it. Dynamite also do specialist catfish baits. For the carp I fish with a 25mm boilie or snowman with 20mm boilie and 15mm popup. Q: What kind of tackle do you recommend for fishing the river? I recommend strong gear! I always use long powerful rods such as 3.5lb TC. Big reels (big pits with free spools) and a main line with 0.40mm thick and 500m capacity. Leads of at least 250gr are also required to withstand the current of the river that is sometimes very strong. Hooks of number four or two are prefect for the job, and hooklengths of around 45lb braid are spot on. It is important to use a shock leader 0.60mm (five meters) or leadcore, as there are a lot of zebra mussels in the bottom river and they can cut your lines like cheese. Q: What kind of rigs do you prefer for fishing the Ebro? Line aligner on wide gape hook, , It is a simple and effective rig, In this river you do not have to be too technical with the rigs. Q: Barbed or barbless hooks? I always use a barbed hook on this river. Q: What makes the Ebro stand out from other big European rivers? It is a wild destination, with turbid waters containing big, hard-fighting carp and catfish. There are also added difficulties which make it an exciting challenge such as big rises in levels or strong winds and stormy weather. It is an unforgettable experience that every angler should try. Q: Why should people from outside of Spain visit the Ebro? Capture wild fish in an emblematic place, it is a popular destination of many European anglers, and maybe because it is a new challenge. Its a great place with warm temperatures, great fish and good food and drink.